Sandra Day O'Connor (born in El Paso, Texas) is a famous Judge from USA, she is 89 years old and still alive, born March 26, 1930. 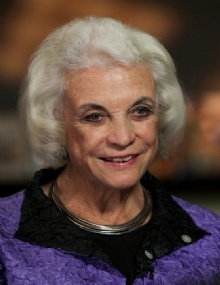 Sandra Day O'Connor is an reitred American lawyer, and was between 1981 and 2005, the first female judge in the U.S. Supreme Court. O'Connor grew up on a cattle ranch in El Paso, Texas. She was appointed to the Supreme Court by Ronald Reagan. After her July 1, 2005 announced that she intends to retire from Supreme Court nominees of President George W. Bush, John G. Roberts, Jr. as her successor. When the then President of the Court William Rehnquist died, it was the candidacy back and Robert was nominated and elected instead to the post of chairman. President Bush then nominated Harriet Miers to succeed O'Connor. Miers withdrew his candidacy and Samuel Alito was nominated instead. O'Connor was in the Iraq Study Group, the Commission headed by James Baker and Lee Hamilton, who in December 2006, published its recommendations for a new strategy in the Iraq war. She is born under the zodiac aries, who is known for Active, Demanding, Determined, Effective, Ambitious. Our collection contains 37 quotes who is written / told by Sandra, under the main topics: History, Nature, Politics. "Having family responsibilities and concerns just has to make you a more understanding person"
"The courts of this country should not be the places where resolution of disputes begins. They should be the places where the disputes end after alternative methods of resolving disputes have been considered and tried"
"The abortion cases produced an enormous amount of mail to my chambers, vastly more than to the other chambers, I am sure. I sometimes thought there wasn't a woman in the United States who didn't write me a letter on one side or the other of that issue"
"My hope is that 10 years from now, after I've been across the street at work for a while, they'll all be glad they gave me that wonderful vote"
"Justice Ginsburg is a very competent justice, and it is a joy to have her on the court, but particularly for me it is a pleasure to have a second woman on the court"
"If I stumbled badly in doing the job, I think it would have made life more difficult for women, and that was a great concern of mine and still is"
"Historically courts in this country have been insulated. We do not look beyond our borders for precedents"
"It is a measure of the framers' fear that a passing majority might find it expedient to compromise 4th Amendment values that these values were embodied in the Constitution itself"
"It is difficult to discern a serious threat to religious liberty from a room of silent, thoughtful schoolchildren"
"Statutes authorizing unreasonable searches were the core concern of the framers of the 4th Amendment"
"What was a problem was the excessive amount of media attention to the appointment of the first woman and everything she did. Everywhere that Sandra went, the press was sure to go. And that got tiresome; it was stressful"
"The members of the court were just delighted to have a ninth member - male or female. They were all kind and welcoming"
"The fact is, we are a nine-member court that sits on cases"
"Society as a whole benefits immeasurably from a climate in which all persons, regardless of race or gender, may have the opportunity to earn respect, responsibility, advancement and remuneration based on ability"
"Occasionally we have to interpret an international treaty - one, perhaps, affecting airlines and liability for injury to passengers or damage to goods. Then, of course, we have to look to the precedents of other member nations in resolving issues"
"My concern was whether I could do the job of a justice well enough to convince the nation that my appointment was the right move"
"It matters enormously to a successful democratic society like ours that we have three branches of government, each with some independence and some control over the other two. That's set out in the Constitution"
"I wanted to be a cattle rancher when I was young, because it was what I knew and I loved it"
"I think the important thing about my appointment is not that I will decide cases as a woman, but that I am a woman who will get to decide cases"
"I don't know that there are any short cuts to doing a good job"
"A moment of silence is not inherently religious"
"Yes, I will bring the understanding of a woman to the Court, but I doubt that alone will affect my decisions"
"The framers of the Constitution were so clear in the federalist papers and elsewhere that they felt an independent judiciary was critical to the success of the nation"
"The Establishment Clause prohibits government from making adherence to a religion relevant in any way to a person's standing in the political community"
"My sense is that jurists from other nations around the world understand that our court occupies a very special place in the American system, and that the court is rather well regarded in comparison, perhaps, to their own"
"Despite the encouraging and wonderful gains and the changes for women which have occurred in my lifetime, there is still room to advance and to promote correction of the remaining deficiencies and imbalances"
"I need to retire from retirement"
"Do the best you can in every task, no matter how unimportant it may seem at the time. No one learns more about a problem than the person at the bottom"
"When I went to law school, which after all was back in the dark ages, we never looked beyond our borders for precedents. As a state court judge, it never would have occurred to me to do so, and when I got to the Supreme Court, it was very much the same. We just didn't do it"
"We don't accomplish anything in this world alone... and whatever happens is the result of the whole tapestry of one's life and all the weavings of individual threads form one to another that creates something"
"Most high courts in other nations do not have discretion, such as we enjoy, in selecting the cases that the high court reviews. Our court is virtually alone in the amount of discretion it has"
"The more education a woman has, the wider the gap between men's and women's earnings for the same work"
"I'm a judge. It seemed to me that it was critical to try to take action to stem the criticism and help people understand that in the constitutional framework, it's terribly important not to have a system of retaliation against decisions people don't like"
"Each of us brings to our job, whatever it is, our lifetime of experience and our values"